Pedestrians on Hunts Point Avenue next to Bruckner Boulevard can now walk with a civil rights heroine by their side. 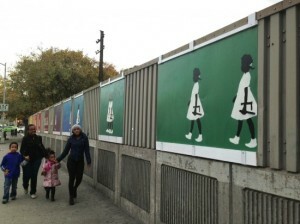 A multi-paneled mural depicting six-year-old Ruby Bridges’ historic walk to school in 1960 now adorns the wall of a bridge that crosses over the railroad tracks. Bridges was the first black student allowed into an all-white school in New Orleans that year. The mural is based on Norman Rockwell’s famous 1964 painting “The Problem We All Live With” which shows Ruby in a cute white dress and braided pigtails, being escorted to school by four federal marshals. The mural, however, shows Ruby walking alone.